Did you know that industrial hygiene and occupational health have been a concern in the workplace since ancient times? Yes, even the ancient Greeks were worried about conditions at work. You can learn about the history of industrial hygiene with this handy infographic: 10 Moments in Industrial Hygiene History. Did you know that one of our industrial hygienists will be speaking at the 2018 American Industrial Hygiene Association Conference and Expo (www.AIHce2018.org)? Craig Maunder will present two case studies on IAQ and radon mitigation on May 21. Craig is a Certified Industrial Hygienest and a Radon Measurement and Mitigation Professional, with years of experience providing him the expertise to know what he’s talking about when it comes to radon and IAQ. At ECOH, our team of consultants are well-versed in determining your environmental consulting and occupational health requirements. Our team's combined expertise in occupational health and industrial hygiene is unsurpassed. Contact ECOH today to learn more about our services at www.ecoh.ca. Indexing Ontario’s Workplaces – Are they safe and healthy? Until recently, there hasn’t been a single measure to determine the health and safety of Ontario’s workplaces, and if they are getting any safer year-to-year. With the new Workplace Safety and Insurance Board (WSIB) Health and Safety Index (HSI) – a first in North America – this information will be readily available each year starting in 2018. The HSI will reflect Ontario’s health and safety performance in one integrated, evidence-based, composite measure. Based on a set of five components, the Health and Safety Index measures how safe Ontario’s workplaces are, if their safety record is improving and where efforts need to be focused to increase worker safety across the province. Prevention – what is being done to avoid risks? Worker Empowerment – how involved are employees in health and safety at work? Workplace Culture – what do employees think of health and safety priorities at work? Enforcement – fines or convictions for poor health and safety practices? Injuries – the frequency and severity of workplace injuries, and how long it takes people to return to work. These components are weighted in relation to the other components, then totaled to reach the single index measure that has been designed to offer a more complete and sophisticated picture of progress on occupational health and safety. Data gathered from April 2017 will set the baseline, with the overall measure report being published annually starting in summer 2018.
starting a productive dialogue about health and safety among stakeholders. As the first of its kind, the Index was created so that it can be easily adapted by other workers’ compensation boards across Canada, making it a pan-Canadian effort. Remembrance Day takes place on November 11 every year, when we take a moment of silence at 11:00 a.m. This was originally done to honour the end of the “war to end all wars”, World War I. Unfortunately, peace didn’t last, and World War II was fought, followed by several international conflicts since. Originally called Armistice Day to celebrate the official end of World War I on November 11, 1918 at 11:00 a.m., Remembrance Day has become a day to honour all those who have fought and those who continue to fight for freedom across the world. Encouraging news, because today more than ever, it seems we need to be reminded that the two greatest conflicts of the early half of the last century were fought to stop fascists, Nazis and other tyrannical despots from curtailing the freedoms of various cultures, religions and nations. For Charlene McManus, Remembrance Day is a time to cherish how the McManus clan got their start. Her grandfather Charles (Charlie) McManus served during World War 2. He signed up with his brother Jack at the Elora Catholic Church along with other locals who were enlisting to fight for Canada and England. While Jack served in the Navy, Charlie was stationed as a cook in England when he met his wife Alice. She was serving as a radar detector for the Scotland Army. Romance can bloom anywhere, even during wartime. Remembrance Day is also a time to cherish family for Rob Lovegrove, who had relatives who served in both World Wars. His grandfather drove tanks in WW1, where he was blinded by a gas attack. Rob’s wife’s great uncle was killed at the age of 17 during the battle of Vimy Ridge. Rob’s other grandfather fought for the British Army in WW2 in North Africa and Italy. Both of Rob’s parents were living in London during WW2 and were forced to evacuate and stay with families in Wales. While these evacuations were meant with good intentions, some of the children sent to live on farms in the country-side were treated as indentured servants. 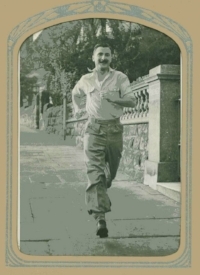 One of Rob’s uncles ran back to London to face the bombs rather than keep living on a farm. My grandfather served in WW2 but never spoke of his experiences overseas. Whatever happened to him, he kept it to himself as if the war never happened. To me, that is why Remembrance Day is so important – to let veterans who served know that while we can’t possibly know what they went through, we value and appreciate the freedoms they fought so valiantly to preserve. My eight-year old daughter attended her first Remembrance Day parade last year as a Brownie. She is proud to be able to honour her great-grandfather and all the veterans and current members of our armed forces. Workplace safety is everyone’s responsibility, but it never hurts to have handy reminders around the job site, whether it’s construction, health care or an office. One of the most effective and convenient ways to communicate workplace safety is with posters. While we’ve been working since humans first stood upright, the safety poster didn’t enter the workplace until the mid-1800s once the Industrial Revolution was underway. The first World’s Fair in 1851 celebrated the rise of the machine age with exhibits dedicated to innovation and progress at work and at home. With workers migrating from the farm to the factory, labour became more and more reliant on machinery. More machinery meant more accidents. 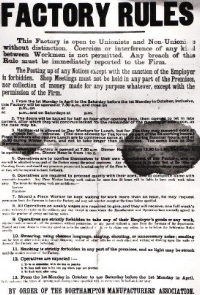 As the Industrial Revolution got into full swing, the issue of worker safety quickly followed. Early posters relied heavily on text, and often focused on rules of behavior in the workplace, including union meetings, breaks and smoking rather than safety procedures. However, most workers in the Industrial Revolution came from the lower classes, and at that time had a very low literacy rate. Eventually, text-heavy posters made way for visual posters that packed a more emotional punch. Posters often showed the worst-case scenario—electrocution, dismemberment and death —and promoting fear to encourage safety became the standard. Graphic design has changed over the years. For example, the early 1900s posters depicted workplace dangers as anthropomorphized – carbon monoxide was a large brutish ghost that could choke a man. Safety posters inspired fear with realistic-looking violent monsters, devils, and animals. 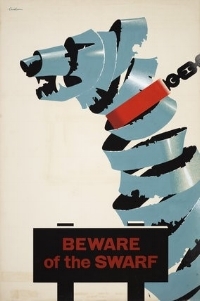 As Cubism, Futurism and the other mid-century -ism movements took centre stage in the art world, danger was now shown as an abstract figure in safety posters, with the emphasis, such as scraps of steel – or swarf – shown as a snarling guard dog, straining at its leash. Up until World War II, most posters focused on men in the workplace, with women starring in home safety posters and materials. 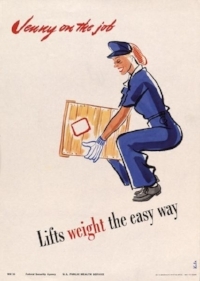 However, once women started playing a bigger role in the workplace in the 1930s and 1940s, they started appearing in more workplace safety posters. “Jenny on the Job” is a series of WW2-era safety posters designed specifically for women working during the war. In this series, the posters reflect women’s important role during wartime, but only three posters depict actual workplace safety tips. The rest reflect the typical mid-century attitude towards gender roles. The posters make it clear - while it was necessary for women to work, they shouldn’t forget their womanly duties too. They suggested in a very paternalistic manner that despite doing a man’s job, Jenny still needs her beauty sleep, fancy fashions, and a reminder to shower regularly. Plus, who’s going to clean up that filthy pigsty of a bathroom? Jenny, obviously. As more and more women entered the workplace after the war, posters continued to reflect a slightly patronizing tone towards women, as exemplified in this image of a women’s long locks getting tangled in a drill press, suggesting that women are more concerned with beauty than safety. Today’s posters focus on more positive messages – “Wear hard hats in this area” and “Hold the handrail” for example – versus earlier fear-mongering posters that emphasized what could happen should you fail to follow the rules. Not only do they focus on the physical dangers at work, they also shine a spotlight on mental health at work, which is just as important as your physical health. Who knew health and safety posters at work had such a rich history? The design of these posters reflects the concerns of the era they were created, and are a great way to explore the history of work.